A proposed new preschool on North San Vicente Boulevard near Harratt Street will be the subject of a neighborhood meeting on Oct. 24. The pre-school is a project of Nasim Pahlavan. Pahlavan’s mother has run her own preschool in Massachusetts for 36 years and is helping her daughter with the West Hollywood project. 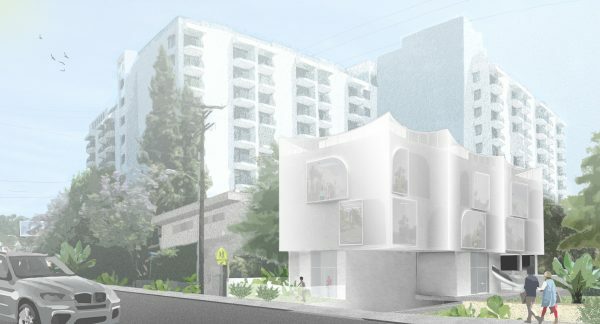 The pre-school will be housed in a new building designed by Lorcan O’Herlihy, a prominent California architect. The three-story building will include a 4,962 square foot subterranean parking garage. It will serve up to 72 children from 18 months to five years old. Pahlavan said the school would meet an obvious need in West Hollywood. Citing data from the California Department of Social Services, she said there are seven preschools located in the Zip Zones that cover West Hollywood, which have room for a maximum of 249 children. However, data from the City of West Hollywood indicates that there are 1,025 children under the age of five in the city. The community meeting will be held from 6 to 7 p.m. in the conference room on the first floor of City Hall, which is at 8300 Santa Monica Blvd. at Sweetzer. Parking is available in the automated garage behind City Hall and at the Kings Road parking structure at Santa Monica Boulevard and Kings Road. Those with questions about the project can send them to Pahlavan 972northsanvicente@gmail.com. Woman Hit by Car Involved in a Street Race on Sunset Blvd. Pre-schools are good, wack-a-doodle designs not so much. I like this building, and the fact that they have designed the parking garage to accommodate the pickup and dropoff of kids, so it won’t back up traffic on the street is great. I wish my preschool was this nice.